The TICTACTILE. 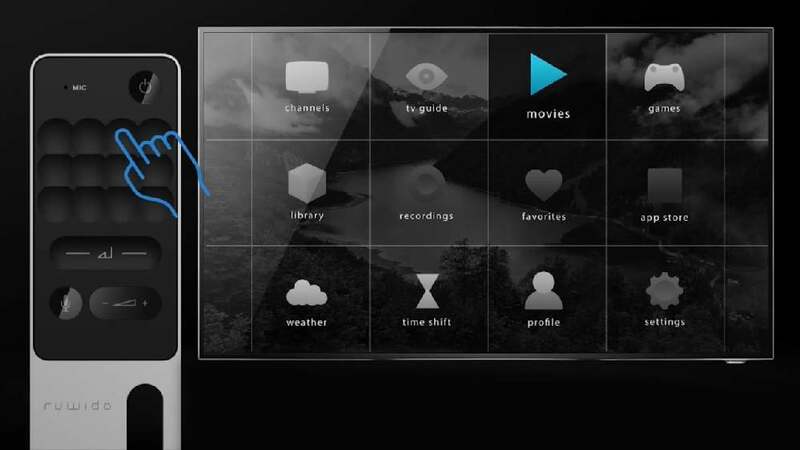 user interface, synchronised with the interaction mechanism of a remote control, has been created as a response to the question of how the feeling of smartphone interaction can be transferred to the TV in the living room and beyond. Carrying on the structure of the user interface onto the navigation field of the remote control enables the fusion of two senses, the visual and the tactile. Haptic landmarks, which have been embedded slightly recessed into the control panel of the elegant remote control, allow navigating within modern user interfaces whilst never looking away from the screen, creating the perceived impression of touching a screen some metres away with the swipe of a finger. The system allows access to 12 actions per screen, such as channels, movies, games, app store or weather, and supports moving through content efficiently. The holistic system strikes the eye with a high-quality appearance. It can be applied not only to one or more screens in the living room, but also in other environments such as in-car infotainment systems. The idea of placing the structure of a user interface in the navigation field of a remote control – in order to close the physical distance between the user and the graphical user interface and thus to synchronise mind and senses – has been realised by the TICTACTILE. system in an outstanding manner. The reduced and elegantly designed interface with tactile operating buttons in a recess configuration allows direct interaction, without having to take the eyes off the screen.